Hey everyone! 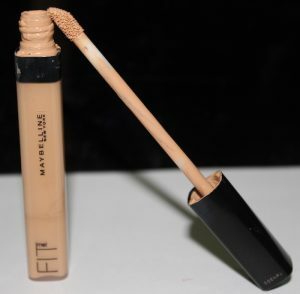 Today I’m going to be reviewing yet another concealer, and this is a cult favourite concealer and that is the Maybelline Fit Me! Concealer. Let’s start by talking about the packaging. It has a dofus applicator in a thin plastic bottle, just like many other liquid concealers. 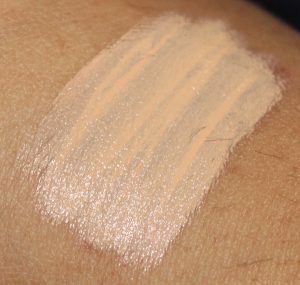 I think the consistency of the product is not very thick, or not very thin, which I think is awesome, because some of the other concealers I’ve tried have either a very thick or very thin consistency, making it look cakey or unnatural. The first time I tried this, I used a BeautyBlender to blend it out. I found it to look very weird, with very light coverage. From the reviews I’ve read about this product, I know it isn’ supposed to be light coverage. Then, I tried using my fingers to blend it out the next time. That’s when it actually gave some coverage. It wasn’t full coverage by any means, so I had to layer some more of the product on top of the first layer. I thought it would look cakey, but, to my surprise, it didn’t look cakey, it only gave more coverage. I used it under my eyes first, and then I popped it on my small pimple scars. It does give a highlighting effect as you build it up. The major drawback about this product is the fact that it creases like crazy, even if you set it with powder. I usually set my concealer with pressed powder, like the Rimmel Stay Matte Powder, because that powder manages to hold my concealer in place. But this concealer just creased a lot. I recall reading a celebrity makeup artist’s advice that the concealer should be set using loose powder instead of a pressed powder, because lose powder prevents the concealer from getting into the fine lines. So, I used my current favourite lose powder, which is the Wet N Wild Ultimate Minerals Powder Foundation to set it, and sure enough, it didn’t crease much. But it still creased, so I’m kind of disappointed with it. I’m not going to say this is full coverage. With the first layer, it’s only light coverage and once you build it up, you get medium to full coverage. To be honest, I know this is a lot of people’s favorite concealer, but I just feel like it’s an average one. I am not saying I dislike it, because for $6 I think this is a deal breaker, but I think there are better concealers at the drugstore.